Nose surgery or rhinoplasty can improve the external appearance of the nose, improve breathing or airways, and correct changes due to trauma. The nose is a complex three dimensional structure. It is made up of lining, a bone and cartilage skeleton and an overlying soft tissue of muscle, fat and skin. Skin on the upper nose is thin and mobile, while tip skin is thick, sebaceous and attached to the underlying structures. Blocked airways may be due to internal structures (turbinates), a deviated septum or narrow airways. It is often possible to correct these at the time of surgery. Nasal surgery is performed either closed (incisions within the nostrils) or open (an incision across the skin bridge between the nostrils, the columellar and within the nostrils). Complex surgery of the tip and septum usually require an open technique which may result in longer-lasting tip numbness and swelling. 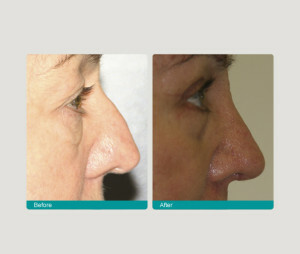 A prominent nose due to a hump on the outer surface or increased projection can be corrected. If dorsal humps are removed it may be necessary to move the nasal bones closer to keep a normal looking, narrow nose. The height of projected noses can be reduced; deviated noses can be straightened and long noses can be shortened. The tip of the nose can be reduced and refined to give a finer appearance and tips can also be rotated upwards. Wide nostrils can be narrowed. At completion of the surgery the nose is taped and a small plastic splint is used on the outer surface. If internal surgery is performed the nostrils may need to be packed. This packing is removed between 24 and 48 hours. Bruising and swelling is common after nose surgery and may extend to black eyes. Sleeping in a “head-up” position will help with this bruising and swelling. Pain and discomfort is usually in proportion to the amount of surgery performed. A blocked and stuffy nose is common. It is advisable not to blow your nose but gently sniff or gently dab with a tissue. Small amounts of blood may be noticed in the nostrils. Infections are rare with nose surgery. A loss of smell and taste may occur and is usually temporary. If nasal bones are moved then there may be small steps at the base of the nose. It is also possible to have some irregularities of the cartilage or nasal bones, which is more common underlying the thinner skin.